Timothy San Pedro is assistant professor of Multicultural and Equity Studies in the Department of Teaching and Learing. San Pedro’s scholarship focuses on the intricate link between motivation, engagement, and identity construction to curricula and pedagogical practices that re-focus content and conversations upon Indigenous histories, perspectives, and literacies. 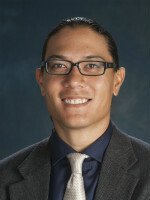 He worked with the Native American Next Step program in Arizona to expand Native American subjects and content in Phoenix-area schools as well as led professional development workshops on the Navajo Reservation that co-constructed and co-envisioned lessons and pedagogical decisions to sustain and support the cultures of students. His co-authored chapter with Valerie Kinloch in Humanizing Research titled “The Space between Listening and Story-ing: Foundations for Projects in Humanization” examines how trust, vulnerabilities, and the development of relationships (or story-ing) provide spaces to engage in transformative resistances and praxis in academic, community, and research settings with participants. Two publications are in press with the Journal of American Indian Education and Research in the Teaching of English. He serves as the chair of the Department of Teaching and Learning’s Equity and Diversity Committee and is a member of the Standing Committee on Research for the National Council of Teachers of English. “Constructing and Complicating Youth Identities: Navigating Language Interactions Within and About a Native American Classroom,” Panel Presentation at the American Educational Research Association Conference, Philadelphia, PA (April 5, 2014). “Story-ing the Contradiction: The Emergence of an Ethnic Studies Course During an Ethnic Studies Ban,” Roundtable Presentation at the Literacy Research Association Conference, Dallas, TX (Dec. 5, 2013). “Genuine Learning: Identity Construction through Voice and Listening,” Panel Presenter at the National Council of Teachers of English Conference, Boston, MA (Nov. 23, 2013). San Pedro, Timothy (In Press). Silence as Shields: Agency and Resistances among Native American students in the Urban Southwest. Research in the Teaching of English. San Pedro, Timothy (In Press). Internal and Environmental Safety Zones: Applying the Safety zone theory to Identity, Motivation, and Engagement in a Native American Literature Classroom. Journal of American Indian Education. Grande, Sandy; San Pedro, Timothy and Windchief, Hawk (In Press). 21st Century Indigenous Identity Location: Remembrance, Reclamation, and Regeneration. In D. Koslow, L. Salett (Eds.). Race, Ethnicity and Self: Identity in MultiCultural Perspective. Washington, D.C.: NASW Press. Kinloch, Valerie, San Pedro, Timothy (2014). The space between listening and story-ing: Foundations for Projects in Humanization (PiH). In D. Paris, M.T. Winn (Eds.). Humanizing Research. Thousand Oaks, CA: Sage Publication.